A LONG-STANDING Portsmouth councillor says he will continue to fulfil his duties, despite having moved more than 550 miles away to another country. Drayton and Farlington representative and former Lord Mayor, Councillor Ken Ellcome, confirmed he had moved to Northern Ireland but will still attend council meetings and 'will be back on a regular basis' until standing down in May next year. The Tory, who has been on Portsmouth City Council since 2011, said: 'We decided to move to Northern Ireland as my wife is from there and she has family over there. She has lived in Portsmouth for 30 years and wants to go home. 'But I will be coming back for council meetings and will be back on a regular basis until elections in May so I will still continue to fulfil my council duties. Cllr Ellcome's most recent three-year term will come to an end in May 2019 when he will not put himself forward for election. But Labour Cllr Tom Coles, of Fratton ward, believed travelling back for meetings was not good enough. 'If Cllr Ellcome has moved to Northern Ireland then he can no longer fully represent the people of Drayton and Farlington,' he said. And independent Cllr Claire Udy (Charles Dickens ward) felt he could have stood down earlier, opening his seat for other potential councillors. She said: 'Of course I wish Cllr Ellcome all the best, he has been a councillor for so long and worked hard for his ward. 'But I am disappointed that he will be living in Northern Ireland and he won't be able to fulfil his duties. 'I heard he has been living there a while. In that case a by-election would've given other parties more of a chance of winning that seat. 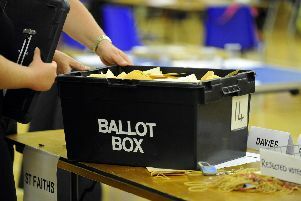 This comes after the news that independent and former Tory councillor, Cllr Jim Fleming who represents Cosham, had to take a leave of absence from the council that was extended until March 20 next year following a vote. There are currently 17 Liberal Democrat and 17 Conservative councillors at Portsmouth City Council. Labour are represented by five councillors and there are three independents.